Synopsis, Our Opinion: CLASSIC Quality wine at a Bargain price. 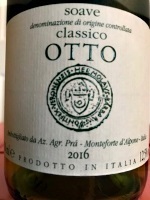 Producer/Winery: Azienda Agricola Prà; Monteforte d’Alpone, Italy. Geographic Appellation: Soave Classico; Veneto, Italy. Paired With: Seared swordfish seasoned with McCormick grill seasoning, fettuccine with parsley, anchovies, garlic, basil, oregano and olive oil sauce and sweet peas. Chilled before opening. Clear, oat straw color. Aromas of baked apples, melon, apricot and Mock Orange (Philadelphus coronarius) blossoms. Smooth, tart, slightly creamy, medium body and 150-grit texture. Crisp apple and apricot flavors entangled with a robust mineral character. Fresh acidity that gives the wine excitement and a long dry flavorful mineral finish that has a nutty upturn at the very end. Mellow, easy drinking, refreshing, yet quite vivacious. CLASSIC Quality wine at a Bargain price. Comments: Learn more about Graziano Prà and his wines. Imported by: Vinifera Imports; Ronkonkoma, New York.